Ant May from Festivalphoto spoke to Paul Mahon, guitarist with The Answer shortly before their gig at Rock City in Nottingham earlier this month. Festivalphoto: You're currently on tour with The Union. Are there any gigs or festival appearances planned for later in the year. Paul: At the moment its mainly European festivals, and then we'll see whether it's Download or Sonisphere, that's the big question this summer. Festivalphoto: Any preference which you'd like to play? Paul: Happy to do either. We did Sonisphere last summer, really good, very refreshing. I think with Download it's getting very mainstream, I think maybe they're trying to cater to too many different tastes. It's almost becoming not that different from a Reading or Leeds, the mainstream festivals, but we've played there many times, and Donington's probably still my favourite festival site. Festivalphoto: Your current album, Revival, came out last year. How has the new material been going down with fans? Paul: It'd been going down good yeah. It's always a good sign when they're calling for more new stuff and don't just want you to play the old songs. We're playing almost the whole album minus one or two songs. It's been very good. Festivalphoto: It's not often you get fans asking bands to play new stuff - it's usually the older stuff that they're more used to that they want to hear. Paul: Yeah. We still play some of the early stuff, "Come follow me", "under the sky" and so on. I guess it's like if you go and see ACDC, you want to hear Back in black, even if its not on Black Ice, so yeah we're happy to cater for that. Festivalphoto: You mentioned ACDC. Obviously you had the pleasure of touring with them on their Black Ice tour. Was it a shock to the system walking into these huge venues? Paul: It was in the beginning, we were definitely very taken aback. We'd had good training up to that point, we'd been out with Whitesnake, Deep Purple and guys like that, so we had an idea of that sort of level, but we did a show with the stones in Belgrade and one in Germany and that was totally off the scale of anything we'd done, and then ACDC was similar to that, but every day. It took a bit of getting used to, I mean its a different atmosphere to play in, when its not your audience then it can be quite daunting to play in those big venues till you get used to it. But we settled in quite well and four or five shows down the line it felt really good, to the point where when we came back, we did arenas in the US and in Europe then in the summer we did stadiums in the US and Europe, and after that we did more arenas with them, and when we went back to the arenas it was like "this feels nice and small, comfortable, up close and personal". Festivalphoto: It must make a big difference as well with the size of the stage as you've got a lot more room to move about? 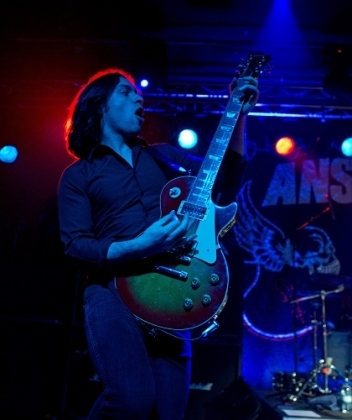 Paul: I like the bigger stage, and it doesnt get much bigger than that - it needs the space for Angus to work his stuff. Festivalphoto: Was it a shock after the tour when you played your own shows in these small venues again? Paul: During the tour on the days off we'd do a few smaller shows and yeah that was quite a strange thing, going into somewhere like the Rescue Rooms, and then the next day you were in the Stade Du France, that takes some getting used to. It was actually quite satisfying when we came back after the ACDC tour and did a tour of the UK at the end of 2009, it was your Rock City's, Academy's and stuff - it was satisfying to come back and do that ourselves. After that we were writing. The other tour we did was much smaller venues, but because we'd been away for a year it didnt feel that different. Festivalphoto: What's your favourite type of live show - festival appearances, big venues or small venues? Paul: I like them all. They all require a different approach. Festivals can be kind of frustrating because you're just thrown in, you don't get chance to sound check so if anythings not quite right you're kind of living with that for the whole show, but I think the audience, they're there for a good time and you get the benefit of the doubt. Big venues are fun yes, but I think my favourite is when you're playing to your own audience in somewhere like Rock City, those ones where you've got a thousand, fifteen hundred people there to see you, they're great. Festivalphoto: What's the songwriting process in the band - is it a collaborative thing or are there one or two main song writers? Paul: Everyone contributes in some way. To start, one way we'd write songs together, is just jamming in a room, and then maybe Cormac would have some vocal hooks straight away or maybe he'd take it away and work with it. Then when he brings it back we'd critique what he'd done lyrically and melodically and hammer it into place. We're always writing as individuals, so might bring an arrangement in that's close to finished, then everyone has to think. It can take us a long time sometimes because everyone has to put their ten cents in, put some kind of stamp on it because that's what makes it a The Answer song rather than say a Cormac Neeson song, and I think that way everyones equally passionate about it, and I think that's important to the chemistry in the band and why we've lasted so long, because we're all involved and excited by it. Festivalphoto: What bands would you say have influenced your music? Paul: I guess going back the obvious ones are Led Zeppelin, Free, Rolling Stones, American bands like Mountain, Leslie West is a big influence on me, early Fleetwood Mac, Cream. Then growing up the ones that excited me were Motley Crue, Metallica and Def Leppard, and I think when we first started playing guitars the music at the time was grunge so band like Pearl Jam, Soundgarden, Smashing Pumpkins, things like that were an influence too. With Soundgarden I think most people wouldnt cite them as an influence on us but as we go on you can hear certain similarities there. Festivalphoto: What are you guys like on tour - the clean living type or the party all the time type? Paul: We don't mean to but it ends up being a party every night. Especially when you're on a tour bus, you can fall asleep any time you want. It's different when you're doing a van tour and staying in hotels - you have to be up at a certain time every day, get your stuff out and be on the road, but on this, days can all blur into one. You don't really have to get up till 3 o'clock in the afternoon, sound check at five, do the show, and your body clock does become the opposite of a nine to five person, but it has to be if you want to be on top form at ten o'clock, so yeah if you come off at laf past eleven or twelve o'clock and you're buzzing, you don't just go put your slippers on, have a cup of tea and read a book, you have a few beers, and with the characters in our entourage something always happens, a lot of partying. Festivalphoto: Which do you prefer when you buy music - Vinyl, CD or legal mp3 downloads ? Paul:Probably CDs. I did have a time in my teenage years when I'd buy vinyl and I'd be fanatical about certain bands. At one point it was Motely Crue, then Smashing Pumpkins, and it would be a challenge to get every format of the single that you could, you'd get the seven inch, the 12 inch, there might be a limited edition 10 inch, a picture disc...I used to be very much into that so had a lot of vinyl, and with all the B sides you could have another albums worth of stuff. So I was into that culture when I was younger, but people dont seem to do that so much these days. I still need a physical release, a CD you can take home, look at the pictures, see what gear they're using, see who they're thanking, that's still all part of the experience. Paul: It was actually the first Talisman album which is not my normal thing but its got Jeff Scott Soto singing on it. Festivalphoto: Ok thanks for your time.